Throughout the Western Church, we are marking Sunday next [27 May 2018] as Trinity Sunday. The doctrine of the Trinity was proclaimed to the world after the first great Pentecost. So, it is fitting that the feast of the Trinity follows immediately after that of Pentecost. However, this tradition of observing the First Sunday after Pentecost as Trinity Sunday has unique roots in the Anglican tradition. The Book of Common Prayer (2004) says Trinity Sunday is marked in the Church of Ireland as one of the ‘principal holy days which are to be observed.’ On this day, ‘it is fitting that the Holy Communion be celebrated in every cathedral and parish church or in a church within a parochial union or group of parishes.’ It says the liturgical provisions for this day ‘may not be displaced by any other observance’ (p. 18). The appointed readings for Trinity Sunday [Year B] are: Isaiah 6: 1-8; Psalm 29; Romans 8: 12-17; John 3: 1-17. There is a link to the readings HERE. Although liturgically we are now in Ordinary Time, the liturgical colours change from green to white on Trinity Sunday. The Book of Common Prayer (pp 771-773) places ‘The Creed (commonly called) of Saint Athanasius, also known as the Quicunque Vult,’ between the Catechism and the Preamble to the Constitution. But it makes no provision for its use. However, some churches in the Church of Ireland and the Church of England have a tradition of using this creed on Trinity Sunday. The early Church had no special Office or day to honour the Holy Trinity. However, with the spread of the Arian heresy, the Church Fathers prepared an Office with canticles, responses, a Preface, and hymns, to be recited on Sundays. There are prayers and the Preface of the Trinity in the Sacramentary of Saint Gregory the Great. However, the Micrologies, written when Gregory VII was Pope, call the Sunday after Pentecost a Dominica vacans, or an ordinary Sunday, when there was no special office, although it did note that the Office of the Holy Trinity composed by Bishop Stephen or Liège (903-920) was recited in some places on this Sunday, and in other places on the Sunday before Advent. Pope Alexander II (1061-1073) refused a petition for a special feast on this day. He pointed out that such a feast was not customary and that the Church honoured the Holy Trinity every day with the use of the doxology, Gloria Patri. When Saint Thomas Becket (1118-1170) was consecrated Archbishop of Canterbury on the Sunday after Pentecost, his first act was to decree that the day of his consecration should be held as a new festival in honour of the Holy Trinity. This observance spread from Canterbury throughout the Western Church. 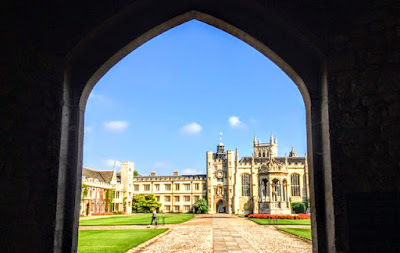 In the following century, a new Office for the Holy Trinity was written by the Franciscan friar, John Peckham (died 1292), who later became Archbishop of Canterbury. Pope John XXII (1316-1334) ordered the feast for the entire Church on the first Sunday after Pentecost. Surprisingly, this feast day never spread to the Orthodox Church. In the Eastern Orthodox and Eastern Catholic Churches, the Sunday of Pentecost itself is called Trinity Sunday, and instead the Sunday after Pentecost is celebrated as All Saints’ Sunday. The Monday after Pentecost is called the Monday of the Holy Spirit, and the next day is called the Third Day of the Trinity. Thomas Hopko of Saint Vladimir’s Orthodox Theological Seminary argues that if God were not Trinity, God could not have loved prior to creating other beings on whom to bestow God’s love. This love or communion of God as Trinity is extended to us in the communion of the Church. It is not just the Trinitarian faith into which we are baptised, but the love or fellowship of the Trinity. Yet many clergy tell me how they are frightened of getting into the pulpit on Trinity Sunday and some will use any excuse to avoid preaching that day. Perhaps their difficulties and fears are well explained by Dorothy Sayers, the playwright, translator of Dante, and author of the Lord Peter Wimsey detective novels, who was also a respected Anglican theologian and writer on spirituality in her own right. For many Christians, the Trinity is incomprehensible, and has nothing to do with daily life. There are those who see God in Christ but in Christ only, and address all their prayers to Jesus, even in the Eucharist, when they should be addressed to the Father through the Son. Or there are those who appear to reduce the role of Christ to that of a super logos, who frustrates the plans of a vengeful but distant God. Their Christology owes more to Arius than the orthodox understanding of the Trinity. And there are those who criticise – and rightly criticise – others for neglecting the Holy Spirit, but who are in danger of neglecting the other two persons of the Trinity. For many more, it appears, the Son and the Spirit are merely manifestations of – or masks for – the Father, a concept condemned in the early Church as Modalism or Sabellianism. Each separate emphasis is fraught with danger and is symptomatic of a drift away from appreciating the centrality of the Trinity to faith and life. Similarly, ‘Jesus-only’ images lead to moralistic action by Christians on the theological left or individualistic pietism on the theological right. For its part, a ‘Spirit-only’ emphasis brings real dangers of either introspective escapism or charismatic excesses. 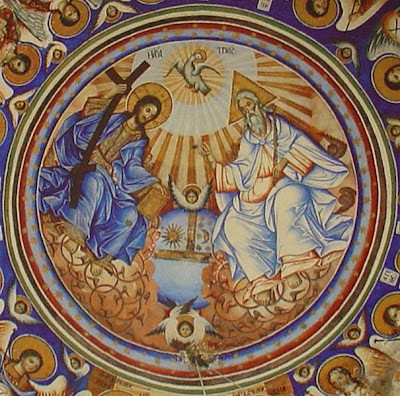 Yet these images are real throughout the Church, because the concept of the Trinity often appears irrelevant, due to poor teaching in many churches and what many be a prevailing anti-intellectual climate. Those who venture bravely into the pulpit on Trinity Sunday are often reduced to explaining away the Trinity as a ‘mystery’ that they expect ‘mere’ lay people not to grapple with. As Christians, we are baptised in the name of the Trinity. But there may reasons to fear that there has been a visible and audible decline in Trinitarian emphases in worship and liturgy. Many of our prayers, canticles and psalms should end with praise to the Trinity. But when they do, the doxology or Gloria often provides a liturgical but thoughtless full stop rather than a statement of faith. Worship that becomes Unitarian in this way becomes a transaction between an external deity and an autonomous worshipper. And it is not possible for a collection of separated and disconnected individuals to become the community of faith, to enter into the life of the Trinity. The general decline in the Trinitarian character of worship, theology and life in the Church today parallels a decline in rigorous intellectual thinking. This is typified in the decline in social emphasis in our time, typified in the infamous claim by one politician some decades ago that there is no society, that there are only individuals. But we can only be human through our relationships; we can only have self-respect when we know what it is to respect others. The Church is primarily communion, a set of relationships, exactly as we find in the Trinitarian God. Christianity is not a private religion for individuals; personal piety is only truly pious and personal when it relates to others and to creation. In today’s anti-intellectual climate, it is hard to imagine the passions raised by the earlier debates on the Trinity, which led to patriarchs being deposed, priests banished, and a Pope such as Honorius I being declared a heretic. Arguments about the Trinity evoked deep passions at Nicaea, Constantinople and Chalcedon, and they continue to be the most divisive issue separating the Eastern and Western Churches. Today, the Church needs to recover a teaching of the Trinity that is not divisive and yet is relevant. There is a certain truth in the adage that man has created God in his own image and likeness. Our attitudes to the Trinity shape our models of God, and our models of God either shape or are shaped by our attitudes to the world: a unipolar God is an authoritarian model; the Trinity is a communitarian, inclusive, embracing, co-operative model. Authoritarian or monist models have dominated the Church for centuries, providing male, authoritarian images of God. But in the New Testament and in the Early Church, the words used for the Spirit (pneuma, πνευμα), wisdom (Sophia, Σoφíα) and the Holy Trinity (Aghia Triadha, Αγία Τριάδα) are neuter and feminine nouns. Monist models of God help to confirm men, particularly men with power in the Church, in their prejudices. 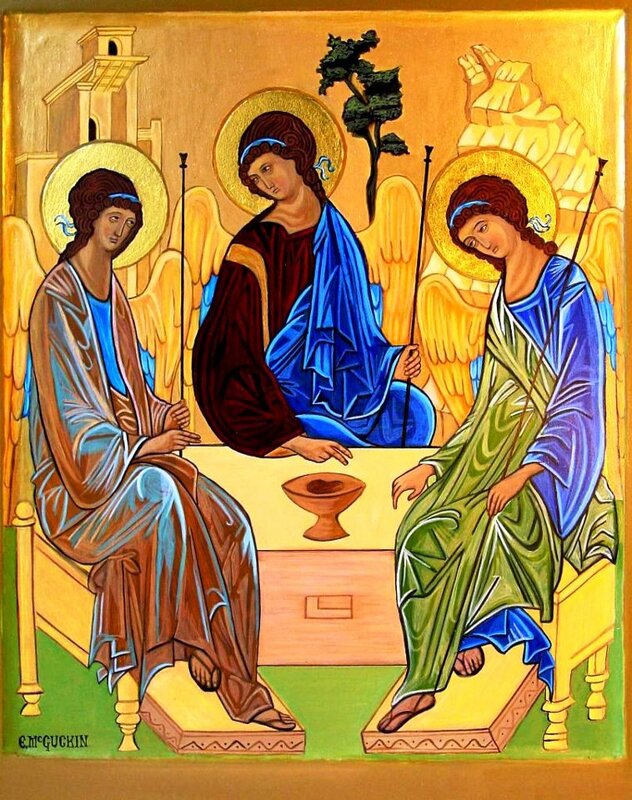 The Trinity is inclusive rather than exclusive of human images. During the Nazi era, the German theologian Erik Peterson (1890-1960), argued that monist theologies tend to legitimise absolutist and totalitarian political and social orders, while Trinitarian theologies challenge them. The Trinity means that as humanity is created in the image and likeness of God, then it is not just as individuals that we reflect God’s image, but that when we are a community we are most human and most God-like. In the true community, each is valued, each takes account of the other, each has an equal place, contribution and voice. True community cannot concentrate sole authority, privilege and infallibility in one gender alone, let alone one member. A recovery of the reality of the Trinity has radical implications for our models of the Church, for authority, service and inclusiveness in the Church. It implies respect for diversity and seeks a communal form of unity that respects, desires and even encourages diversity in the community of faith. Compared with the great social and political challenges facing the Church, discussing the Trinity may seem to many to be as relevant as debating the number of angels on the head of a pin. Yet the Trinity is not only the archetype of all created reality, but without a fuller understanding of the nature of the Trinity, the Church will never be able to apprehend the truth of the infinite goodness of God. The love and coinherence or perichoresis of the Trinity is a joyful dance that is at the heart of our understanding of God’s love for us and for creation, of our fellowship with God and one another, and of our understanding of our ministry and mission. Without a proper teaching on the Trinity, the Church will continue to provide answers to social and political questions that make God more like an idol than like our model for a loving community. In this reading, the Prophet Isaiah gives the grounds for his authority as a prophet. The year is 742 BC, and Assyria is expanding its borders. The northern kingdom, Israel, is trying to coerce Judah into a military alliance against the Assyrian threat. Isaiah has a vision of God enthroned, surrounded by courtiers, with seraphs hovering above him, guarding him. One pair of wings cover ‘their faces’ in the awesome presence of God, and a second cover their ‘feet’ as a sign of commitment to purity; the third is used to fulfil commissions from God. The acclamation ‘Holy’ is repeated three times for emphasis, identifies God as all-holy, sinless, apart from earthly things. God is the Lord of Hosts, the warrior for Israel; he rules over the whole earth, all peoples. The setting appears to be the Temple, so the ‘pivots’ that which shake due to an earth tremor – a sign of God’s presence – are those on which the heavy Temple gates turned. Smoke is also a sign of divine presence, as is the cloud of glory in the desert (Exodus 40: 34). Isaiah feels totally inadequate in God’s presence: he feels unclean, unfit to stand before God, yet he sees God. He also sees the people as unworthy, but a seraph purifies him, rendering him fit and qualified to speak God’s word to his people. God confers with his advisors, asking ‘Whom shall I send ... ?’ Isaiah volunteers to be the prophet to Judah. Later, after this reading (verses 9-13), God accepts his offer, and tells him that most people will reject God’s message, preferring traditional, corrupt ways. Within nine years, Assyria had invaded and made Judah a puppet state. This psalm expresses God’s supremacy and universal rule. The voice of the Lord is heard in the thunder claps as the storm approaches and sweeps across the land, breaking the tall trees as it moves. The Word of God is indeed mighty, and all acknowledge God’s supremacy as they cry ‘Glory be to the Lord!’ God rules over all from his throne. Saint Paul has told us how Christian experience is dominated by life in the Spirit rather than by the desires of the flesh, or self-centeredness. Christians are still subject to suffering, to bearing crosses and affliction, but not to eternal condemnation. Not being condemned, we have hope. Now he says that we are under an obligation to God, to live according to the Spirit. Living this way, rejecting self-centeredness, we look forward to eternal life at the end of time rather than to the finality of physical death. Heeding the Spirit, we are children of God, and have a new relationship with God. When we are baptised, we are adopted by God. As his children, we are heirs, with hope for the future. In seeking his help or proclaiming him as Father, we express the close relationship we have with him, with our hearts motivated by the Spirit. Nicodemus is a prominent Pharisee and teacher who comes to Christ to ask him questions. He comes under cover of darkness at nigh so that he would not been meeting Christ. He understands Christ’s miracles that he is from God. But Christ tells him that he has not yet understood the main point. To see the kingdom of God, spiritual rebirth is needed. Nicodemus misunderstands: he thinks Christ is speaking of biological rebirth. But being ‘born from above’ (verse 3) requires being baptised (verse 6). Flesh and spirit were seen as constituents of life, of which spirit (pneuma) was the life-giving force. Many things can be seen only in their effect; such is birth in the Spirit. Still Nicodemus does not understand. In order for him to do so, he needs to have faith. Then, in verse 12, Christ tells Nicodemus that he does not comprehend what can be told in analogies, and so asks how he can possibly believe mysteries. God in his love provides eternal life to all who believe. If you wilfully do not believe, you will perish. There is no third alternative. God’s intention is that you believe, rather than be condemned. Andrei Rublev’s icon, the Old Testament Trinity or the Hospitality of Abraham. 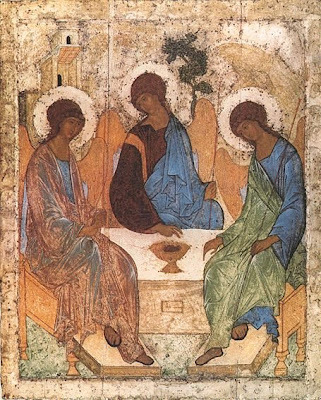 One of the best-known presentations of the Trinity is found in Andrei Rublev’s icon, the Old Testament Trinity or the Hospitality of Abraham. This icon recalls the passage in Genesis 18, in which God visits Abraham and Sarah at Mamre. As the story unfolds, it becomes clear that Abraham’s guests – now only a single guest – is God. Rublev’s icon itself is a masterpiece of composition: The viewer is being invited to join the meal; the doctrine of the Trinity as a community of Love into which the believer is invited to enter is depicted with clarity and simplicity; the icon communicates the idea that basis of the divine life is hospitality. The vanishing point in the sacred space is placed in front of the icon, inviting the viewer to enter into the holy mystery. The author of the Letter to the Hebrews picks up the theme of the Hospitality of Abraham at the end of his epistle when he advises Christians not to neglect hospitality: ‘Do not neglect to show hospitality to strangers, for by doing that some have entertained angels without knowing it’ (Hebrews 13: 2). As I was preparing these notes for Trinity Sunday, I found myself re-reading the poem ‘Trinitie Sunday’ from The Temple (1633) by the Welsh-born English priest and poet George Herbert (1593-1633). And I will strive to sinne no more. That I may runne, rise, rest with thee. George Herbert’s response to the mystery of the Holy Trinity is a response of heart, mouth, and hands. In this poem, he is creative, evocative and imaginative in his use of Trinitarian images, prayers and motifs in rhymes, alliteration and ideas throughout the three stanzas, which give wonderful glimpses, prayers and insights into our Trinitarian faith. The poem is a delightful use of word, rhythm and structure, inviting the reader to become familiar with the concept of three, reminding us of the threefold nature of God as Father, Son and the Holy Spirit. Each stanza is three lines long, and each is in triple rhyme. Stanza 1 is a prayer of invocation, with Line1 addressing God the Father as Creator, Line 2 addressing God the Son as Redeemer, and Line 3 addressing God the Holy Spirit as the Sanctifier. Stanza 2 is a confession. Line 1 refers to sins committed in the past, Line 2 to the present act of confessing, and Line 3 to the firm intention not to sin in the future. Stanza 3 is an expression of expectation, and each line refers to three things. Line 1 speaks of heart, mouth and hands being enriched. Line 2 outlines that which will do the enriching – the three Christian virtues of faith, hope and charity. Line 3 expresses a desire to run, rise and rest with God. In the third stanza, Herbert continues with three little triplets of petitions. Father, you come to meet us when we return to you. Jesus, you died on the cross for our sins. Holy Spirit, you give us life and peace.